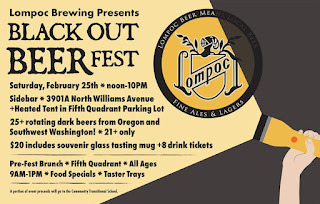 PORTLAND, Ore. – Jan. 18, 2016 – Lompoc Brewing has announced that its annual Chowder Challenge will take a hiatus this year to address venue and space issues. In its place, the brewery has expanded its popular Black Out Beer Fest to an all-day event. The 5th annual Black Out Beer Fest will take place on Saturday, Feb. 25 from Noon to 10pm at Sidebar, located at 3901 N Williams Ave, and in the heated & tented parking lot in front of the Fifth Quadrant restaurant (around the corner at the same address). The event will feature 25 rotating dark beers – including porters, stouts, coffee beers and black IPAs – from Lompoc and more than 20 guest breweries from around the Northwest. Admission into the event is free; tasting packages are required to taste the beers and cost $20, which includes a souvenir 15.5 oz glass mug and eight beer tickets. Additional beer tickets are available for $1 apiece. It costs four tickets for a full mug of beer or one ticket for a taste. A portion of the proceeds will be donated to the Community Transitional School. The event will kick off the morning of Feb. 25 with a pre-fest Brunch at Fifth Quadrant from 9am to 1pm, featuring an exclusive brunch menu paired with specialty dark beers. Black Out Beer Fest ticket sales will take place at the door in Sidebar; advance tickets are not available. The beers will be served in both Sidebar and in the tented and heated parking lot adjacent to the Fifth Quadrant pub. The event is for ages 21 and over, although minors and attendees are welcome inside the Fifth Quadrant pub. Follow LompocBrewing.com or @LompocBeer on social media for updates to the beer list. Lompoc (pronounced Lom-Pock, much to the chagrin of Californians) creates eight flavorful year-round beers, plus a ridiculous number of seasonals. You can find Lompoc in 12-ounce and 22-ounce bottles and on draft at locations in Oregon and Washington, and at its five Portland neighborhood pubs: Fifth Quadrant and Sidebar in North Portland, Hedge House and Oaks Bottom in Southeast, and the Lompoc Tavern in Northwest. For more information, call 503-288-3996 or visit www.lompocbrewing.com and @LompocBeer on Facebook, Twitter and Instagram. Drink Local, Drink Lompoc!